So after 5+ years, we finally have a new version of Java. In spite of mixed reviews, as a software engineer working a lot on the JVM, I still wanted to take it for a spin. However, being an Ubuntu user, this involves a tad bit of work since there are only RPM and binary packages available at this time. So until there are official or unofficial .deb packages available, we're going to have to sneak in the raw binaries outselves. The following is how I did this on my 64bit Ubuntu 11.04 system. I take no responsibility in breaking your existing Java installation yada yada, you do this at your own responsibility. Start by downloading the binary. Remove packed archive and move/rename the extracted folder into something a little more Ubuntu appropiate. Follow the Ubuntu tradition, by symlinking a generic major java version to a concrete minor version. Override Ubuntu's standard alternatives mechanism, replacing links to Java 6 with links to Java 7. It would be better to use the update-alternatives tools available in Ubuntu, but I was unable to make this work. If you screw something up here, you may have to uninstall and reinstall your JDK/JRE stuff, in order to revert to a working Java installation. Finally, we may aid various client software in locating where Java in installed, by adding a few environment variables. Do this by editing .bashrc in your home directory. Restart and that's pretty much it, this worked for me, hope it works for you too. Otherwise, throw me a comment below. Update: If you are unable to run applets wtihin your browsers, this may be caused by the existing Java Plug-in 1.6 clashing with the new incompatible JRE 1.7 you just installed. To remidy this, you can launch the Java Control Panel and disable the JRE 1.7, making 1.6 the only (and thus default) one. As you can see below, you still retain Java 1.7, but applets and webstart won't try to use any of this new stuff. I'm not sure what your problem is Тим, except that you could try to give it execute permission if it does not already have that (chmod +x). I suspect there could also be a platform issue involved, i.e. are you sure you're using a 64bit JRE with a 64bit version of Ubuntu? I'm providing a collection of Ubuntu packages on my own package repository. 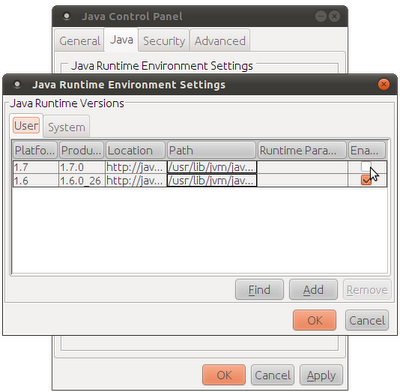 The packages are fully integrated in the Ubuntu way to support Java. the standard tools: update-alternative or update-java-alternative. To obtain the packages, you only need to add my package repository into your system configuration.